Eco-Dent travel pack toothpowder provides "airplane safe" way to brush your teeth and as a powder is not prohibited by screening checks at airports. People are no longer allowed to carry toothpaste, mouthwash or tooth gel with them in their carry on bags or hand luggage. It is likely these restrictions will remain in place indefinitely. Meanwhile, people like to be able to brush their teeth and freshen up. Eco-Dent has the solution. 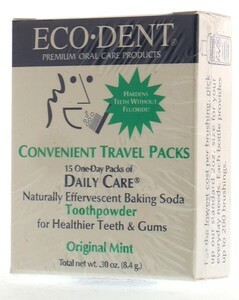 Eco-Dent Toothpowder travel pack contains 15 1-day packs of toothpowder. Each 1-day pack is sufficient for two brushings. These convenient pouches fit easily into a pocket, purse, wallet, backpack, fanny pack, attaché case or other travel bag. Because this is in powder form, it is not restricted by the airlines. Eco-Dent toothpowder is the premier toothpowder with over 70 years of use in Europe and the USA. It is recommended by numerous dentists and clinical researchers because it can help harden teeth without fluoride. It is easy to use (just sprinkle a little onto a toothbrush), tastes great, and leaves the mouth feeling fresh and clean. The effervescent action helps bring the cleansing action between the teeth, providing an extraordinary tooth cleaning experience. It is also much more economical than using toothpaste and has the added benefit of being "airport safe". The convenient travel pack allows the user to choose how many days' supply to carry at a time, without taking up space or adding weight to the luggage. Information is available by visiting our website at http://www.eco-dent.com or calling 888 ECO DENT. Division of Lotus Brands, Inc.